Most clothing made to stop snakes is heavy, rigid, and bulky. Using a mere 6 oz. fabric, TurtleSkin SnakeArmor is one-third the weight of other snake protection hunting gear, yet has been tested to stop the bites of even large rattlesnakes. 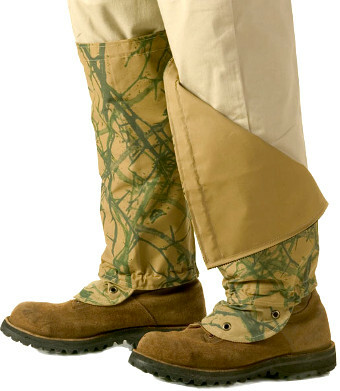 TurtleSkin SnakeArmor's reversible gaiters are designed so that you can wear either the natural camo pattern or easily reverse it to the lighter khaki side. Made from a blend of high-strength ballistic fibers and polyester in a super-tight weave, SnakeArmor gaiters are also windproof, waterproof, and flexible. Simply close up the back and cinch the elastic top for a snug fit.